A November 15 protest in Manhattan calling for improvements to rent laws. Gov. Cuomo has endorsed those calls, but some advocates are leery of the governor's past record. The new Democratic majority in the state Senate, coupled with a solid Democratic majority in the Assembly, creates an opportunity for hard-hitting legislation to restore our rent and eviction protection laws, and expand tenant protections statewide. But this will not happen simply by virtue of the Democratic majorities. The real-estate lobby will use every dollar at its disposal to push back, so tenants must be prepared to work hard between now and next June, when the rent laws must be renewed. For years, the Democratic Assembly has reliably passed legislation to strengthen tenants’ rights, only to see the bills die under a Senate Republican conference essentially owned by the New York City real-estate industry. One-house bills are notoriously easy to pass, but with the GOP senators headed to the minority on January 1, the stakes are now real and tenants need our allies to stand strong. Fortunately, our new Senate Majority Leader Andrea Stewart-Cousins has long been one of the tenant movement’s strongest allies, and should be more than ready to work with Speaker Carl Heastie to stand up against real estate. 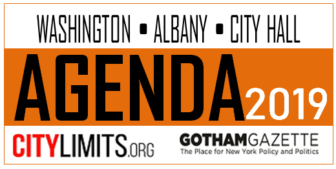 They have conferences of legislators who will back them up, including many members who ran on a platform of stronger rent laws (including challengers who defeated the rogue IDC Democratic state senators). Some history is in order: Stewart-Cousins was a Westchester County legislator when then-GOP senate majority leader Joe Bruno announced that he would not renew the rent laws in June 1997, unleashing a firestorm of tenant activism. Stewart-Cousins organized five town hall meetings in different parts of her Yonkers district to alert and activate tenants; I spoke at four of them. We helped tenants write letters on the spot to their GOP senator, Nick Spano, whom Stewart-Cousins defeated a decade later. She helped pay for buses to Albany that year, and helped us fill them. Stewart-Cousins is the lead Senate sponsor of our most important bill, which repeals vacancy decontrol and re-regulates 98 percent of the apartments we have lost since 1994 (in New York City) and 1997 (in three suburban counties). Her Senate district has more rent-regulated units than any other outside the five boroughs. However, we might still face danger from the second floor of the Capitol. 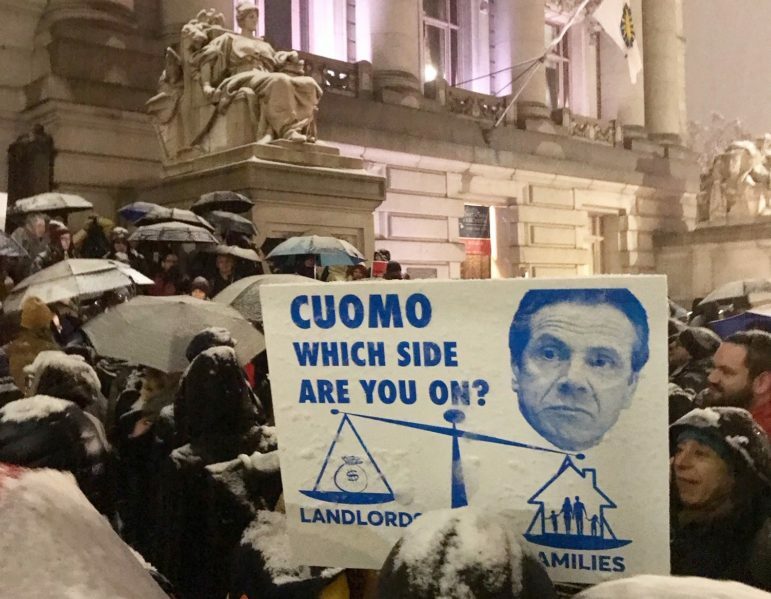 It remains to be seen whether Andrew Cuomo’s election-year conversion to tenant advocate was sincere. This year, he committed in writing, for the first time since he became governor, to the repeal of vacancy decontrol and other reforms (thank you, Cynthia Nixon!). But tenant advocates are suspicious that he might try, behind closed doors, to sabotage this effort by cynically raising the deregulation threshold, as he did in 2011 and 2015, and calling it a great tenant victory. Raising the threshold is a meaningless change that guarantees New York State continues to lose affordable housing, because big landlords will spend the money to reach the threshold, and dishonest landlords will do what they do now: stop registering the apartment as required, jump the rent on a vacant unit without spending on renovations, and wait four years: If the tenant does not file an overcharge complaint within that time, the landlord gets away with illegal deregulation. Every legislator who cares about affordable housing must make it clear to Cuomo that this is not acceptable. Tenants must also keep an eye on the real-estate lobby. In the past, landlords showered cash on Republican senators and Governor Cuomo, but that began changing as they saw the handwriting on the wall. Earlier this year landlords began throwing money at the Democrats, falling back on their tried and true method of stealth and cash to get what they want. This is why, in additional to repealing vacancy decontrol, re-regulating deregulated apartments, ending the preferential rent scam, repealing the 20 percent statutory vacancy bonus, and closing the loopholes allowing huge rent hikes for building-wide and individual apartment improvements, Albany must pass campaign finance reform. We need to lower the current high campaign contribution limits; repeal the LLC loophole (which allows landlords to set up separate limited liability companies for each of their buildings, circumventing the limits on what they can give candidates); and create a small-donor matching fund for public financing of elections. Tenants must also be vigilant about Airbnb, which will try win legislative approval for predatory practices that allow landlords to remove apartments from the market and convert them to illegal hotel units for tourists. The past year has seen a growth of tenant activism in all parts of New York State. Tenants in Rochester, Syracuse, Akron, Kingston, Binghamton and other areas are feeling the pinch and are organizing to remove the arbitrary geographic restrictions on our rent laws, which cover only New York City and Nassau, Westchester and Rockland Counties. The law should apply to all 62 counties, allowing any city, town or village in the state to opt into the system if a survey shows the local vacancy rate to be five percent or less. And because the law covers only buildings with six or more units, we need legislation to prohibit evictions without good cause, as has existed in New Jersey for more than four decades. This will protect tenants in smaller buildings (including in the city) from arbitrary or unjust eviction. Many politicians are surprised to learn that the New York City tenant movement is not seeking repeal of the Urstadt Law. Enacted in 1971, this law prevents the New York City Council from enacting stronger rent laws. While repeal would be good for tenants in the five boroughs, it would undercut the movement for statewide rent protections and divide the tenant movement into more parochial subgroups. While many reporters, editors and politicians all write and speak of rent regulation as affecting only the city, we cannot ignore the suburbs and the rest of the state. Tenants will never be a serious political force until we have a strong statewide tenant movement, and adequate protective laws in all corners. Renters need and deserve protections, wherever they live. This is what tenant advocates mean when we call for universal rent control. Even if we are able to restore our rent laws in 2019, it is important to recognize that more than two decades of deregulation have produced a big hit on affordability. Unfortunately, we cannot undo all of that; we cannot roll rents back to 1994. A Community Service Society analysis of census data concluded that the city lost more than 490,000 apartments affordable to low-income families between 2002 and 2017, attributing this to vacancy deregulation, loss of subsidized housing, and rising rents in regulated and unregulated housing. 2019 will be a watershed year. Everyone who rents, and everyone who cares about affordable rental housing, should join the fight. If we think of this as a war and ourselves as a tenant army, we can win, and win big. Michael McKee is treasurer of the Tenants Political Action Committee. Tenants PAC works to elect pro-tenant candidates.